-Oh hey, I feel like this is an important episode. -Oh, right, B'Elanna becomes Chief Engineer! And then I proceed with the show and spend most of it reveling in the primordial Janeway/B'Elanna relationship. When these two women talk it's never dull. Their chemistry as actors and as characters is perfect. B'Elanna is, in many ways, a younger Janeway. They're both passionate scientists, they both possess a commanding presence, they both work hard to do the best they can for their ship and the people who rely on them, they can both be obsessive and they can both get depressed and agitated if there isn't enough going on. B'Elanna, of course, struggles with some extra issues. In Caretaker we already got a glimpse of the inner turmoil she faces thanks to her battling Klingon/Human halves. In Parallax we get a little more. The episode starts out with her punching a fellow crew member and then refusing to apologize. 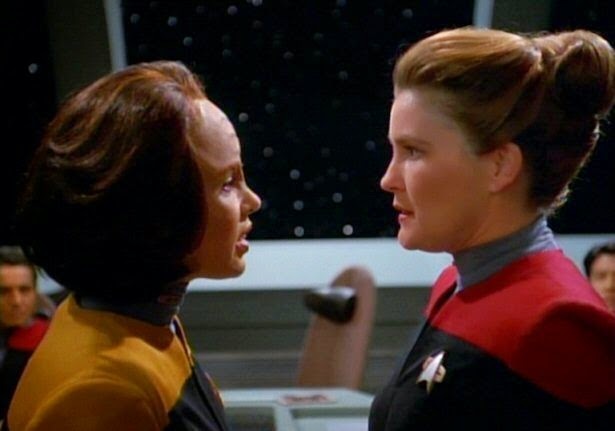 When she faces Janeway, she's combative from the outset. At every turn, she wants to fight. But then it comes down to solving a puzzle and B'Elanna shines. As I watched this one, I couldn't help but think about all the great and terrible things that lay ahead for this character. I love B'Elanna and seeing her in these early stages reminds me of why. She is never not fighting a war within herself but that never keeps her achieving great things along her journey. I love her evolution and I can't wait to watch her grow and evolve all over again. Standout moment for me: when faced with Chakotay's recommendation of B'Elanna for Chief Engineer, Janeway actually considers his words and puts aside her own trepidation to give B'Elanna opportunities beyond her huffy first encounter, to prove herself worthy of the job. There's character growth and trust-built across the board. (ie: Carey being enlisted by Torres herself, to help keep her in line with Starfleet regs and policies.) The mere act of Janeway telling Torres that she's not sure if she'd be doing her any favours by giving her the position, and asking Torres if she herself, thinks she's the one for the job... is evolved/civilized behaviour beyond any circle of human beings I know. lol Viva la Janeway!